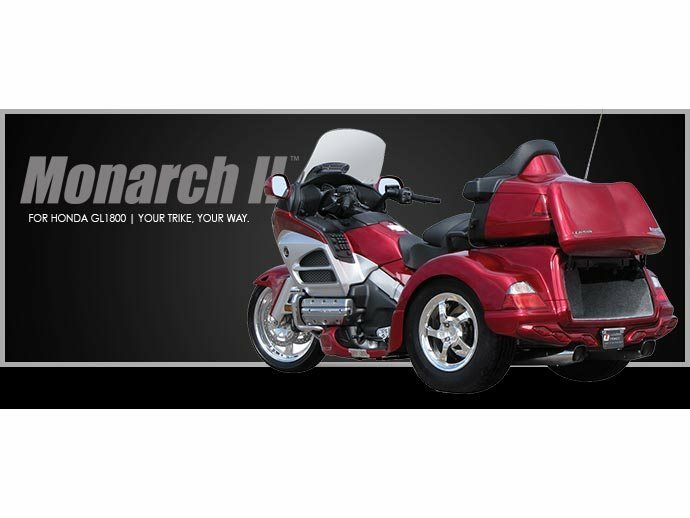 The Monarch II remains a touring legend in motorcycle trikes for Honda GL1800. Featuring Lehman Trikes patented "No Lean" suspension featuring a solid axle design which minimizes flex of the swingarm and rear-end system. The one-piece reinforced design is constructed to reduce sway and body roll giving you the benefit of "No Lean" in curves, keeping you upright in a fast turn and giving you better handling performance. 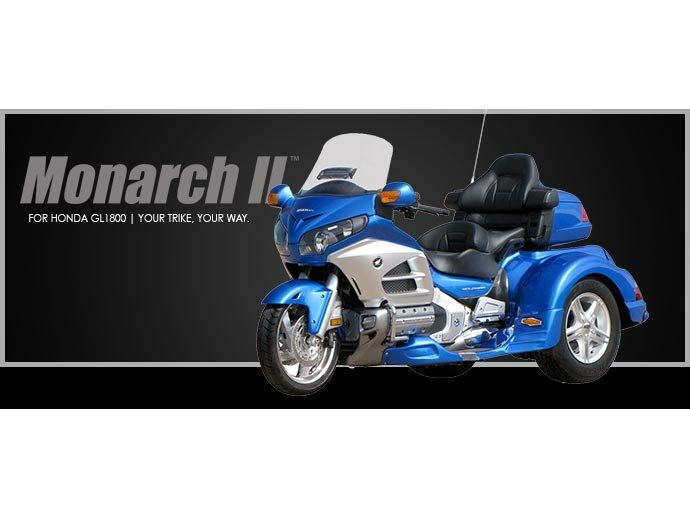 The Monarch II features a vertical lift trunk door, isolastic cushion ride suspension, optional parking brake, and reverse. Made from Resin Transfer Molding (RTM), the Monarch II body is created using two molds. The molds are coated with a gel-coating, fiberglass matting is then laid into the receiving mold and the molds are put together. The resin is then injected and allowed to cure. Any excess is trimmed off and the result is an extremely durable one-piece body with a smooth, consistent finish inside and out with no weak spots. Accessories such as running boards and light bars are also manufactured in our fiberglass shop using urethane. Your Monarch II for Honda can be painted by the Lehman Trikes factory or by your authorized Lehman Trikes dealer. Our professional painters use state-of-the-art equipment to create an exact color match on the trike body and any accessories you have ordered to go with your trike. 2-3 coats of base and 2-3 coats of clear are applied to ensure a consistent, beautiful coverage. At the factory, we prep the body in wet sand and dry sand. The body is then sent to polish and quality assurance to check for any imperfections. All imperfections are completely removed and reworked before moving to the conversion line. 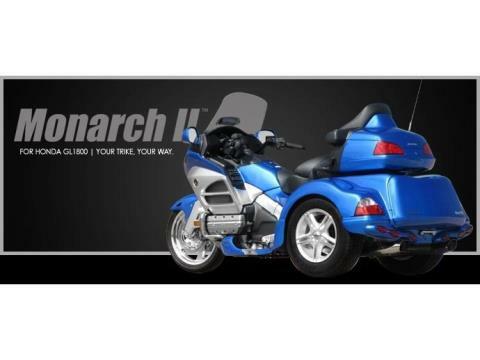 The Monarch II motorcycle trike also utilizes the existing reverse to assist in backing out of tight spaces. There are many optional features you can also add to your Monarch II motorcycle trike to further enhance your riding enjoyment including: a parking brake which is a convenient feature that keeps your trike parked in place, Wing EFX Running Boards, Light Bar, Hitch Kit, Wheel Upgrades, Mud Flaps, Trunk Mat & Liner, Trike Cover, and Triple Tree. All Monarch II for Honda bodies are quality assured during key stages of the conversion process to ensure your trike looks and performs at a superior level. Our quality assurance team works independently from all other departments and inspects each conversion and test drives all trikes before they leave our facility.